Tottenham Court Road Station is in the final stages of its upgrade. A key feature of the six times larger ticket hall is the new 'Diamonds and Circles' works 'in situ' by Daniel Buren. Buren is considered largely as France’s greatest living artist and his conceptual public art interventions can be seen worldwide including Odaiba Bay in Tokyo and the Palais-Royal in Paris. 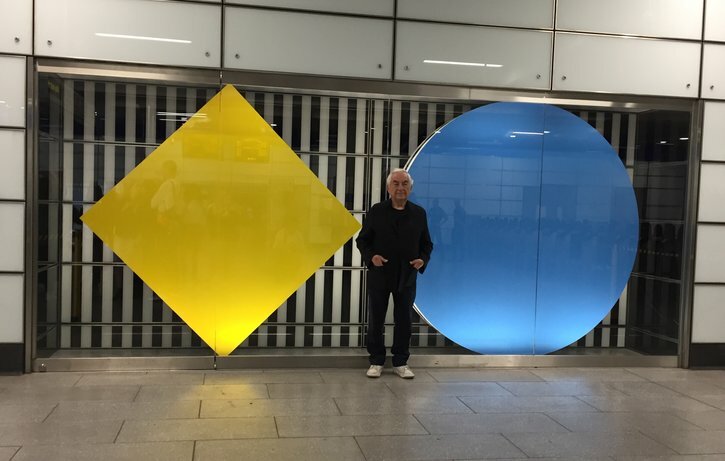 On Friday 30th June, Daniel Buren visited Tottenham Court Road Station to officially unveil the three-dimensional sculpture of a blue diamond and yellow circle behind glass as pictured. This artwork commission has been a long time in the making with the artist having to wait almost a decade to unveil his finished piece within the completed station. Buren’s other artwork in the station consists of: a black and white circle and diamond striped installation at the Oxford Street entrance; a colourful circle and diamond installation at the opposite end of the station for the glass plaza entrances; and a glass partition of white and transparent stripe by the Dominion entrance to separate access past the gate line. The 8.7cm stripe is a constant in Buren’s work and has been used since the late 1960’s and 1970’s. The key concepts of his work are: disruption of public space, simplicity in form, and the arbitrary systems of organisation. His fixed stripe in size is a tool to measure space. The simplicity of colours and shapes are a wonderful addition to the mosaics installed by Eduardo Paolozzi in the 1980’s, enriching the journeys of over 100,000 passengers each day.